And so “Star Wars Episode VIII: The Last Jedi” came to theaters in a storm — tearing up everyone we claimed to love about the old Star Wars and replacing it with new and exciting legends. Fans are split — most people seem to have dug it a lot, but those who hated it, really hated it. Still, there’s one thing we can’t deny. Some of those new creatures were aces. While “The Force Awakens” was low on new creatures (Beastie Boys named Ello Asty, aside), “The Last Jedi” is rife with the good stuff. Here are our absolute faves. As seen on the casino planet Canto Bight— was on screen for just for a few seconds — screaming in rich person terror as Finn and Kelly Marie Tran’s Rose destroyed this island of 1% on the back of a fathier (see below!). Immediately she gave off the look of a genetic wealthy dowager, and we love her for it. She exists for one reason — to be shocked at the actions of commoners — and shocked she shall be! The Star Wars visual compendium claims that she is “new money,” covered in eggs (awesome) and is an opera singer looking for a “hatching partner.” Kathleen Kennedy if you are listening, I am demanding an Ubbla Mollrbo movie. Ahch-To, the island on which Luke resides — is known for its peacefulness, and the kind-hearted, but very frustrated fish women known as The Caretakers — who have to constantly clean up after Rey keeps casually destroying their little village. Oh, Caretakers! After years of General Grieviouses and Jar Jar Binkses— all dying for us to know how menacing or wacky they are— I’m glad these fish nuns just don’t give two gills. Caretakers, I salute you and your life of peace. Gosh these things are cute. The Vulptices are fox like creatures with crystaline skin (who look a lot like a mix between Glaceon and Jolteon, for all you Poke’mon fans out there), who live on the salt planet Crait. Their skin is such a crystal white so they can blend in on the planet, but I just wonder— what do these guys eat? Is it a big pile of salt? Questions, questions… Also Crystal Foxes is an incredible 2006 era indie band and I cannot wait to watch their new concert. The Fathiers — out of all the new creatures — played the greatest role story wise as Kelly Marie Tran’s Rose and John Boyega’s FInn rescued them and used them to wreck havok on that planet of 1%’s, Canto Bight. The fathiers were beautiful, soulful beings who were manned by enslaved children and just have the nicest eyes. Aww! I want one! I want a fathier! Oh, daddy, buy me a fathier! I deserve it I do! What else can be said about the Porgs that hasn’t? I love them, they’re adorable, funny and weird. One of the Porgs even makes it to the end of the movie and can be seen in the final victorious shot of the rebellion. 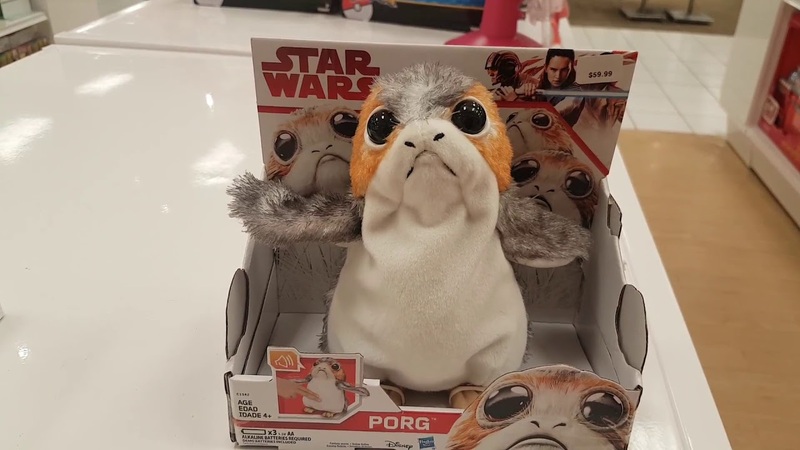 Yes, a Porg in the sequel! Chewbacca even cooks one. In a movie with great visuals we both get to imagine petting a Porg AND eating a Porg!? A+! Dobbu Scay. When I searched for him, Google asked me if I meant Dobby Scary. I could not find a picture of him, so I had to draw it from memory. But give him some time, the movie just came out on Thursday, gosh darn it! Dobbu Scay is special for a few reasons. The first, he is a drunk little creature of muttonchops who thinks BB-8 is a slot machine and keeps feeding coins into his vent. But what’s more — he was voiced by that super talented king of the airwaves, Mark Hamill! Outside of playing Luke Skywalker, Mark Hamill has also played Skips on Regular Show, The Channukah Zombie on Futurama and — most celebrated — the Joker on Batman: The Animated Series. He now returns to the voice booth to play the drunken casino man, Dobbu Scay. Godspeed. I could not find a picture of you online, so here is a no doubt coin-filled BB-8. I can’t believe I had the most to say about Dobbu Scay. Go figure. What do you think? Were there any new creatures I missed? Let us know in the comments or on Twitter at @WhatsTrending. Is This a Real Invisibility Cloak?